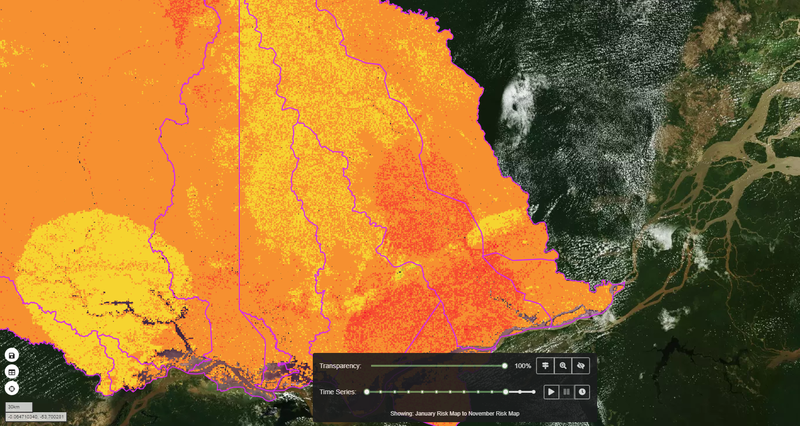 This app demonstrates a risk map showing relative fire risk across 11 municipalities in the State of Para in Northern Brazil. The model combines both physical data (land use, terrain slope, terrain altitude, aspect, proximity to roads) with climatic data (precipitation, temperature, potential evapotranspiration and water deficit) to show how the relative risk of fire varies spatially over the region as well as temporally throughout the months of the year. The product is designed to aid decision makers with land management and fire mitigation techniques, to avoid the likelihood of fires igniting as well as improve strategical placement of fire fighting equipment for more effective fire extinguishing. More information about the methodology and science behind the risk maps can be accessed here.